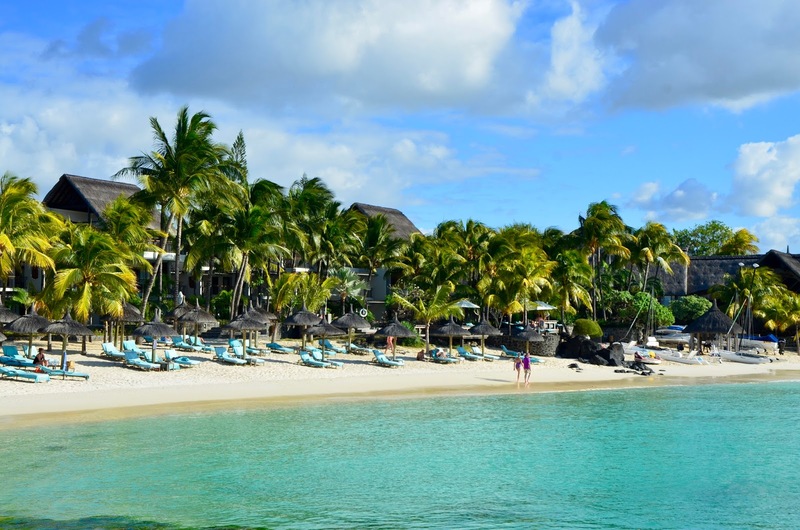 Mauritius is geographically seen a part of Africa, its neighboring islands are Madagascar und Reunion in the west and Seychelles in the north. The island benefits from the fact that the time zone difference to Western Europe is only 3 hours, however the flight time from there is quite long (about 11 hours). Hotel Royal Palm is located on the north west coast of Mauritius and is protected quite well from the trade winds. 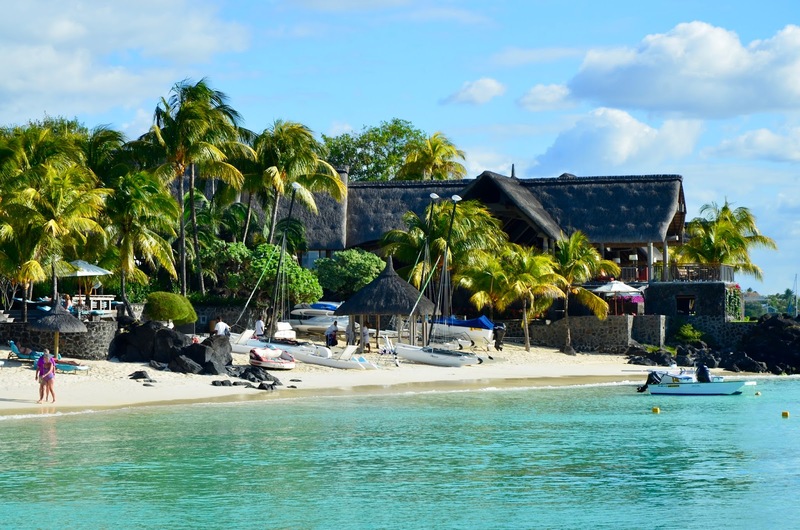 Its setting on a white sandy beach in the outskirts of the lively town of Grand Baie is perfect. The location is secluded, but the town center is only a short walk away from the hotel. This luxury hotel has all the amenities you can think of and even more. After an extensive renovation everything has a fresh new look, but without losing its soul in this process. There are 3 restaurants, 3 pools, an exceptionally well-equipped fitness center, a beautiful spa, tennis courts and a squash court. Water sports are complimentary (incl. 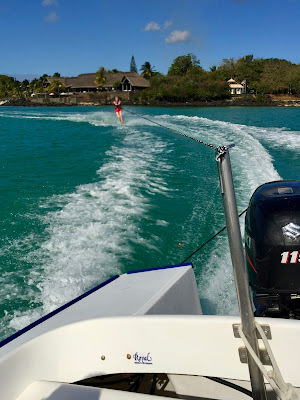 waterskiing) and of course there is a beach, one of the most beautiful ones I know. 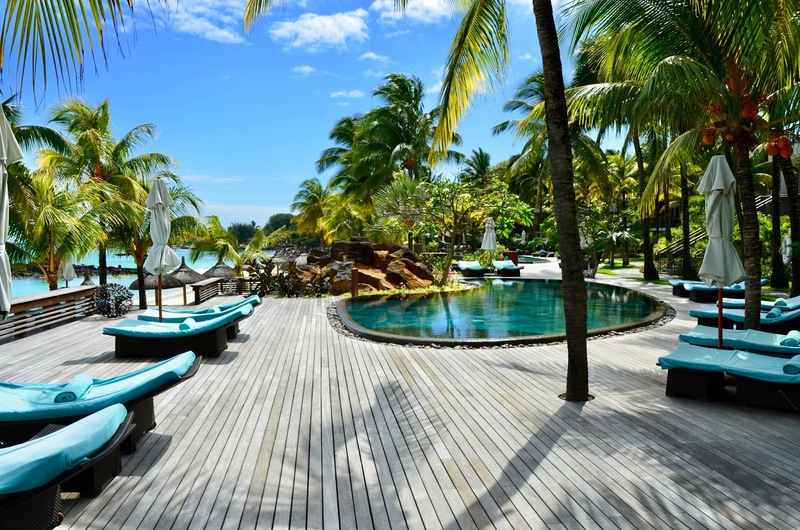 There are about 70 suites, all of them are sea facing and lavishly decorated in a contemporary style. My husband and I opted for a Tropical Suite (85 sqm), which is a bit larger than the Junior Suite, is located on the 2nd floor and has a private staircase leading to the beach path. The last two features are favorable because first the view is better and second you are only steps away from the beach area. 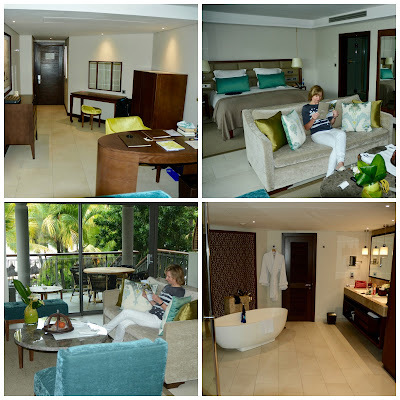 The Tropical Suite has a generously sized bedroom with an adjoining lounge area, a large terrace and a spacious bathroom. The beach is dreamlike, it is one of the most beautiful I am aware of. The sand is white and smooth, the water clear and of a blue that is second to none. There are more than enough sun loungers, at least when we were there end of mid season/beginning of high season. They have a special regime when it comes to who is sitting where. Seats are allocated by the beach manager, i.e. you have always the same ones for the whole stay. I do not know the allocation criteria, probably it has something to do with your type of room and whether you are a regular guest or not. Anyway, my husband and were not in favor of our allocated seats as they were a bit far away from where most other people were seated. The beach manager offered us another place of our liking for the next day, which we accepted. 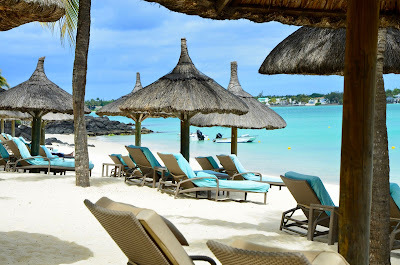 However, we considered the whole regime as a bit unusual, but there are probably no easy solutions how an allocation of sun loungers to guests can work properly. A stay at the Royal Palm does not come cheap – of course. When we stayed at the hotel in the changeover from mid to high season we could at least profit from lower rates at the beginning of our vacations. In high season, prices are steep, hence it may be advisable to go there outside the peak season. I already mentioned that the hotel is very popular with French guests. That also shows with the staff. Many executive positions are filled with French people as well. In lower positions there are locals, but not all of them like speaking English. It is quite obvious that many prefer speaking French with you. But do not get me wrong, there is no problem to communicate with the staff in English. I think that most employees are perfectly able to do this, but nonetheless their dislike to do this was something I could not help noticing. 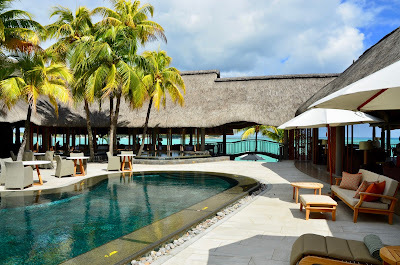 Having said that, the service at Royal Palm is near to faultless, mostly you are treated like royalty, especially at the restaurants and at the bar. The staff at the reception desk however seems sometimes to be a bit reserved. Overall, you feel well cared for. There is the option to be on half board at Royal Palm, which we made use of it and found it a great thing. Breakfast and dinner take place at La Goelette, the main restaurant in a stunning setting overlooking the bay. For breakfast, there is a small buffet for cereals etc. All the rest – juices, hot dishes, bread and pastry basket – are served by amiable & competent staff. Everything is tasty and of high quality. For dinner, there is an exquisite five-course meal. The food is one of the best I ever had at a hotel. The cuisine is creative, but not too much so. The chef – a Frenchman – is a true artist in his field, every dish we had was a feast for the eyes and the palate. Alternatively, dinner can be taken at La Brezza, an Italian restaurant, which is also nice, but we preferred La Goelette. The idyllically located Le Bar Plage under a huge tropical tree on the beach is the place for either a quick (for us) or a leisurely lunch. And it is such a nice thing to do. The setting is breathtaking and the food is delicious. We normally had only a starter, which is enough to bridge the period until dinner. I cannot think of many hotels being equal to Royal Palm. 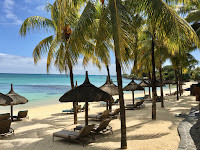 The setting on a splendid beach in the outskirts of the lively town of Grand Baie, the gorgeous hotel premises, the high service quality and the outstanding cuisine make it one of the best luxury hotels I have stayed to date. Thank you for your kind comment! I will keep up my work.